the formation of a jellylike substance over the ends or within the walls of a blood vessel, with resultant stoppage of the blood flow; called also coagulation. Clotting is one of the natural defense mechanisms of the body when injury occurs. A clot will usually form within 5 minutes after a blood vessel wall has been damaged. 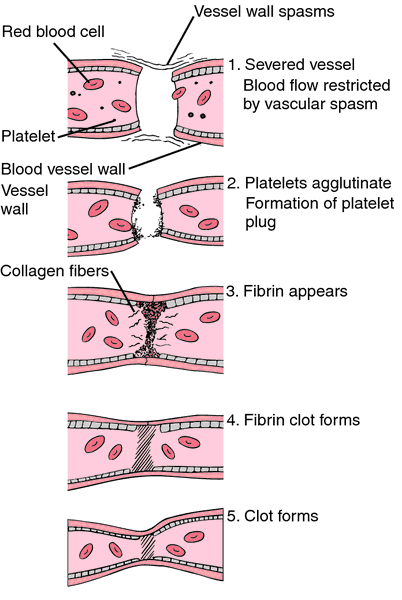 The exact process of clotting is not known; however, it is believed that the mechanism is initiated by the platelets, which adhere and aggregate as they come in contact with the injured surface. As they aggregate they release serotonin and other substances from their dense granules. Serotonin causes constriction of the blood vessels and reduction of blood flow. Thromboplastin unites with calcium ions and other substances that promote the formation of fibrin. When examined under a microscope, a clot consists of a mesh of fine threads of fibrin in which are embedded erythrocytes and leukocytes and small amounts of fluid (serum). Twelve factors essential to normal blood clotting have been described; see coagulation factors. At least four platelet factors also exist that have a part in clotting. It is possible for a clot to form within a blood vessel if the inner wall of the vessel has been roughened by injury or disease. Clots may form in conditions such as arteriosclerosis, varicose veins, and thrombophlebitis. An internal clot that remains at the place where it forms is called a thrombus; the general condition is called thrombosis. If the clot (or pieces of it) breaks loose and flows through the blood vessels, it is called an embolus, and the condition is called embolism. Clotting of the blood can be hastened by contact with injured tissue, by warming, by adding such coagulants as calcium, or by combination with thromboplastin and thrombin. The process can be retarded by cooling, by dilution, by adding oxalates and citrates, or by administration of substances such as heparin and dicumarol, called anticoagulants. Process of coagulation; the transformation of blood from a liquid into a semisolid mass. the formation of a jellylike substance over the ends or within the walls of a blood vessel, with resultant stoppage of the blood flow. Clotting is one of the natural defense mechanisms of the body when injury occurs. A clot will usually form within 5 minutes after a blood vessel wall has been damaged. The clotting mechanism is triggered by the platelets, which disintegrate as they pass over rough places in the injured surface. As they disintegrate they release serotonin and thromboplastin. Serotonin causes constriction of the blood vessels and reduction of local blood pressure. Thromboplastin unites with calcium ions and other substances which promote the formation of fibrin. When examined under a microscope, a clot consists of a mesh of fine threads of fibrin in which are embedded erythrocytes and leukocytes, small amounts of fluid (serum), and platelets. a series of plasma proteins which are related through a complex cascade of enzyme-catalyzed reactions involving the sequential cleavage of large protein molecules to produce peptides, each of which converts an inactive zymogen precursor (factor II) into an active enzyme (Iia) leading to the formation of a fibrin clot. They are designated by Roman numerals, and an additional 'a' to indicate the activated state. They are: factor I (fibrinogen), factor II (prothrombin), factor III (tissue thromboplastin), factor IV (calcium), factor V (proaccelerin), factor VI (no longer considered active in hemostasis), factor VII (proconvertin), factor VIII (antihemophilic factor), factor IX (plasma thromboplastin component; Christmas factor), factor X (stuart factor), factor XI (plasma thromboplastin antecedent), factor XII (hageman factor), factor XIII (fibrin stabilizing factor). the time required for blood to clot in a glass tube; a measure of the intrinsic system of coagulation. In the Lee-White method, blood in test tubes is maintained at a constant temperature and examined regularly until clotting occurs; the test can be also be performed in capillary tubes. Called also coagulation time. Less sensitive and now less often used than the activated coagulation time. clotting factor III; tissue thromboplastin. Q. What causes blood clots? My father had a heart attack which was caused by a blood clot. Am I at risk for developing blood clots too? How do I prevent it from happening? Q. very dark blood clots @ first sight of period? At first sight of period, instead of normal rosy spotting it's brownish spotting followed by small clots. A. totally agree with hottie, most likely that will be in normal range of variation. unless you feel some unusual pain, then you need to find medical advice. but it is also suggested for you to go to your ob-gyn doctor for a regular checkup anyway. If you take clotting factors off the membrane, they're thousands of times less active. Drew Fromkin, President and CEO, explained, "Warfarin is commonly prescribed for the treatment and prevention of blood clotting, but dosing is a challenging process requiring frequent monitoring to achieve a stable maintenance dose. Both diseases are the result of a deficiency in or defective production of certain naturally occurring clotting factors in the bloodstream. In this regimen, clotting took less than half as long as it had in a trial 2 days earlier with the same animals breathing clean air. The scientists at Okayama University concluded: "The clotting properties (partial thromboplastin time, prothrombin time and the amount of fibrinogen) for plasma in contact with samples of hydroxyapatite and plasma which did not have any contact with hydroxyapatite were the same. This safety concern led the researchers, midway through the trial, to stop accepting people who had a history of clotting problems, such as a previous heart attack, chest pains, or blocked leg veins. Not only did about 10 percent of their clot-promoting fibrinogen disappear, but more detailed analyses also revealed that much of the remaining fibrinogen underwent structural changes that compromise the clotting process. Antithrombotics are drugs that prevent blood factors (platelets and fibrin) from aggregating or clotting and subsequently blocking blood flow. Unlike standard gauze bandages, these strong, flexible mats actively promote blood clotting. Recent research conducted by the University of Oslo in Norway reveals that consuming two to three kiwifruit per day can work to thin blood, reduce clotting and lower fat in the blood that can cause blockage, without negatively affecting cholesterol levels.